Last year, I was able to save up as much as Php1000. Now I know that does not sound a lot. Anyone can just save up 1000 in one pay day right? Are you kidding me? Really? So what makes this saving special? I’ll tell you a little secret how I was able to save up that much without a sweat and without much effort. This is between us, ok? But you can tell it to anyone if you want. Swear? Pinky promise. So what’s my secret of saving up Php1000? Those are accumulated centavos. Yes you read that right! Those little centavos that you often seen lying on the ground, on the floor, hiding in our pockets never to see light again and more. Over the years, the value of such centavo is declining. We often cringe on the mere fact that the supermarket cashier gave you 5 centavos or 25 centavos as change. Even more, we don’t use it or circulate it anymore. It really is heart-breaking to see those centavos almost anywhere. Not a single one even attempted to get it and save it. If there are tip boxes or donation boxes, we put those centavos there instead. Simply imagine how much did our government spent to just realize the creation of those centavos. Even more those are not made up of papers. Those are made up of copper, brass, nickel, zinc and whatnot. Even more, the government circulated many of those to us. True enough, we can say that the current centavos have no use at all. We cannot buy an item for 5 centavos right? No wonder people don’t use it anymore. Even the bigger 1 peso is diminishing in terms of value. If the cashier would say she would be short by a few centavos, we don’t even care. We are even relieved to not carry that currency right? It adds space to our wallets and some may even say it is worthless. With that, why not let us turn around our perspective with these little centavos. Why not let’s make it worthy and add value in there. How will we do it? Let’s save up our centavos on top of our 52 Week Money Challenge! And I have been doing that since time immemorial. I have a specific piggybank that caters to 1 Pesos and down. I collect every centavo I could find in my pockets and around the house. I even feel happy if I’ve get to receive it as change. I always insist that they give me even the smallest centavo possible. So how can we add value in the centavo? For one, when collected it could yield a greater sum. Take my 1000 example. I was able to accumulate that much amount with the help of those centavos. If you are having a hard time saving up today, it would be wise that you start it with the lowest denomination possible. And these centavos are great starters to make savings a habit. You would be surprised after how many months you were able to save up this much. And this could mean you would be able to save up bigger amounts and bills. Aside from that, you can always deposit those centavos in your bank. The common reason why we are not using those is simply because we don’t know where to use it. But our banks can help us with that. You can deposit those accumulated centavos in your account and when you withdraw it, they will give you a greater denomination. For instance, if you saved up 100 pieces of 5 centavos, they would give you 5 pesos instead. Now that may not sound big at all, but simply imagine if you were able to accumulate many centavos in a year’s time. And lastly, you are doing the country a favour. The Bangko Sentral ng Pilipinas has been encouraging us to circulate those centavos. 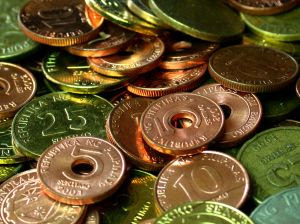 Centavos that were stored, hidden or thrown are considered a loss in the country’s end. That is why they encourage that you use it. Depositing it in banks is a good way to do that. You can even use those centavos as your fare money or even payment at stores. Remember how most of our cashiers are asking us if we have 5 centavos, 25 centavos or what not? Instead of saying no, at least we give them and release the centavo. Money, regardless of denomination is still money. That is why, even how small those things are it is best that we get to save it up and use it in the future. This also holds true for those centavos. That is why when you see a centavo next time, pick it up and save it up. For sure after 52 weeks, you can be able to save tons aside from the ones you saved from the 52 Week Money Challenge and 52 Week Money Challenge Version 2.